The R650 is a surveillance receiver that picks up the transmissions of listening devices and wireless radio transmitters. 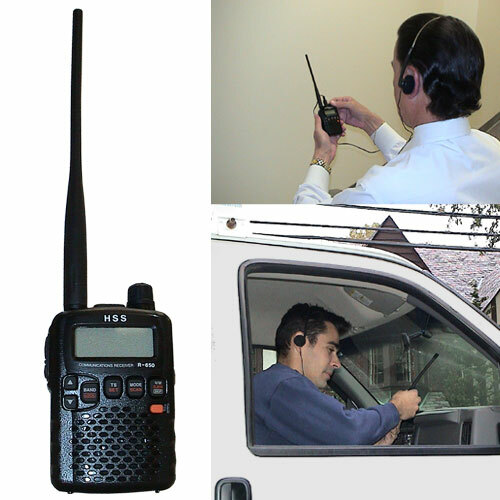 It is a lightweight, compact, handheld wide band receiver that allows reception of listening devices via its manual and automatic search features. The Surveillance receiver R650 has the ability to filter out all radio traffic signals and receive only preset frequencies. This is vital when receiving radio signals from multiple transmission sources. Stealth Squelch: The CTCSS decoding and tone squelch features eliminate background popping noises & reduces reception static. In addition, the R650 has an LCD control panel that indicates the operating channel number and frequency of the channel. Its internal memory storage (IMS) keeps all preset frequencies in memory in the event of power loss, preventing channel memory deletion.